Sagittarius has many open clusters and a few nebula of which this is one, the Lagoon Nebula. Sunday night was a 10 out of 10 for seeing, especially for imaging. This image is only 23 minutes long. 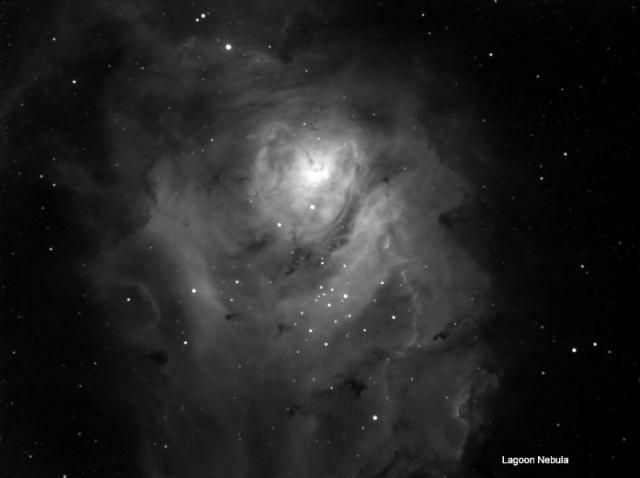 I have a 66 mm scope mounted on top of the Orion 80ed and was viewing the Lagoon Nebula while taking images. I could not believe my eyes as to the clarity and beauty this nebula shows in a dark sight. The dark areas could not be illuminated by the stars and appear darker than the background. Approximately 5,000 light years away and 50 light years across. Hydrogen gas, dark dust lanes and bright turbulent center. This image was taken in Ha. Man, this is your best work yet! When you doing that ?